A new model for determining band gaps for flexural elastic wave propagation in periodic composite plate structures containing square and cruciform inclusions is developed using a non-classical Mindlin plate model incorporating the microstructure and surface energy effects. 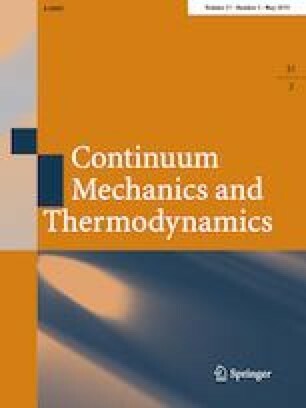 The new model reduces to the classical elasticity-based counterpart when both the microstructure and surface energy effects are not considered. The plane wave expansion method and the Bloch theorem for periodic media are used in the formulation. The band gaps predicted by the newly developed model depend on the microstructure and surface elasticity of each constituent material, the unit cell size, and the volume fraction. To quantitatively illustrate the effects of these factors, a parametric study is conducted. The numerical results reveal that the microstructure and surface energy effects on the band gaps are significant only when the plate thickness is small. In addition, it is found that the first band gap size decreases with the increase of the unit cell length according to both the current non-classical and classical models. Moreover, it is seen that the volume fraction has a significant effect on the first band gap size, and large band gaps can be obtained by tailoring the volume fraction and inclusion shape. Communicated by Victor Eremeyev, Holm Altenbach. Paper submitted for the special issue of Generalized Media with Applications. The authors would like to thank Prof. Victor Eremeyev and two anonymous reviewers for their encouragement and helpful comments on an earlier version of the paper.